You’ve probably seen your share of a brownie recipe or two. Let me assure you this one is different in the best kind of way… its’ taste. My kids love this recipe so much that I have to make it at Christmas. It’s become a tradition at our house. This is no basic chocolate brownie. This one has three delicious layers that make it unique. The first layer is the brownie layer. Next comes a creamy mint layer made with creme de menthe. The last layer is a dark chocolate layer made with melted chocolate chips. These layers together make for a taste and texture that will have your taste buds dancing. This dessert is on the rich side so small pieces are in order when serving this. Mix all the cake layer ingredients together with an electric mixer. Pour into a 9 x 13 baking dish. Bake for 30 minutes at 350 degrees. You’ll see the brownie pull away from the sides of the baking dish. Cool cake. Beat mint ingredients until fluffy. Spread with a knife over cooled cake. Melt the glaze ingredients in a double boiler. Cool a bit, maybe 5 minutes then spread over mint layer. Chill in refrigerator for 20 minutes or until hardened and cut into squares. I make this recipe every Christmas and give as gifts to neighbors and friends and I always get rave reviews and many requests for the recipe. 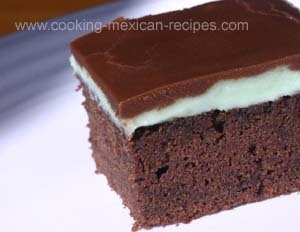 It’s not your average mint brownie. Try it and see if it doesn’t turn into your next family tradition. Check out more dessert recipes here.